Yesterday afternoon Maile and I carried something from the house to the garage that probably would have left spectators rather curious. It’s a bit of a walk between the two buildings, and our feet slipped a little on the stone driveway. I walked in front, holding it against my back, and since it was kind of a two-person operation, Maile came behind me, also helping to carry it. I had made a wisecrack about this thing just inside the door, but Maile nearly crumbled into tears, so I decided to keep my mouth shut. It’s 82 steps from our front door to the garage. I never counted before – not sure why I did last night. But at about step number 40, I heard Sam start wailing from our tiny little front porch. Sometimes we struggle to decipher his two-year-old-boy dialect, but last night his words rang out through the cries, perfectly clear. Nine years ago in a small cottage, somewhere in England between Wendover and Great Missenden, a man delivered three huge boxes to our house, then took his shoes off, came inside, and began assembling shiny white pieces of furniture. The nursery he worked in smelled of fresh, green paint. We left the windows open to air out the room and could hear the lambs crying for milk in the pasture behind the house. He took his good old time, but when he finally left we had three little pieces of furniture: a changing table, a wardrobe, and a crib. Through the years and various moves we watched each piece find another home. The changing table went to some friends; the wardrobe drove off from a spontaneous garage sale in the bed of a rickety pick-up truck; still, the crib remained. We always seemed to need it. But not anymore. 82 steps to the garage. We carried the crib between us and put it down in the corner. All four of our kids slept in that crib, on that insufferably soft mattress, in homes all over the world: Wendover, England; Leesburg, Virginia; Paradise, Pennsylvania. Sam recently figured out how to remove two of the spindles, sneaking out to play with toy cars, then dashing back in when he was found out. It’s a strange thing, moving into the next phase of life. I have mixed feelings about it. 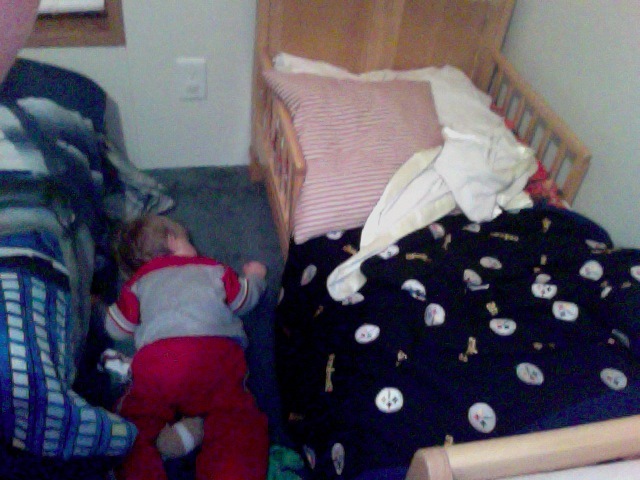 (Photo: This is what Sam thought of his new bed on night #1). Anyone else recently confronted with concrete examples of life’s constant movement? I felt like after I delivered my daughter to her first grown-up apartment a few months ago. The college group house she lived in with 8 roommates was more like living in a dorm than an apartment. After graduation she got a full time job (in her field, no less) three hours from where I live. So this was different; her own place, by herself, with just her stuff (well, a lot was handed down from me). This was a huge milestone for me. I have to admit made the transition from crib to bed many years ago seem insignificant. just let him have his crib back!!! Oh. I have tons of these, and this one might be too … girly, but the day I stopped nursing each of my babies felt like the day I shipped them off to war or something. I felt rejected, unnecessary, peripheral. Turns out, each step they take, each new stage is one more step away from me. And while that’s hard for mama, it’s the way it needs to be. I sympathize with Maile. And you. I can attest that those days were always a big deal for Maile. Baby #5 and I’m ready to get rid of that stinkin crib! I’m sure I’ll miss it when it’s gone. Time really does speed up as we get older. I can’t believe My oldest is 10. Enjoy them Shawn! Thanks, John. It’s strange when that last one starts pushing past the mile markers.